It's bird! It's a plane! It's a Griffin! 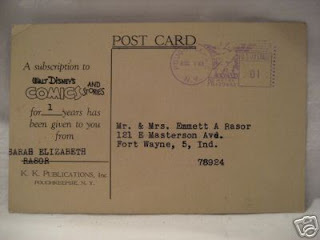 Another rare WDC&S subscription card. Early 40's X-9 art by Graff! Some people just got way toooooo much talent. Hedvig, who's sitting behind me here in the studio and also assists me on "Emma & Sara", just finished this page for a griffin story. 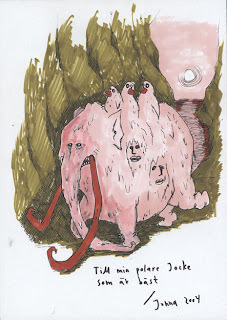 She's also working on her first sketchbook scheduled for SPX in Stockholm. Some really good stuff in it from what I've seen. I'll let you know more as soon it's available. 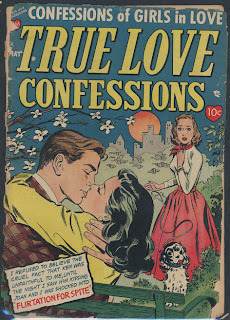 the cover to True Love Confessions no. 1, May 1954. You know that that dogs face will haunt you when you sleep, don't you? I browsed the Heritage auctions website the other day.
" 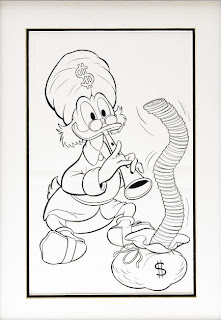 Carl Barks - Uncle Scrooge #19 Cover Recreation Original Art (Another Rainbow, 1989). 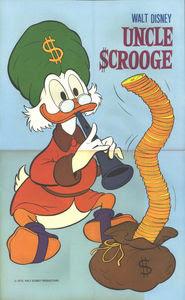 Uncle Scrooge animates a stack of coins with his golden musical touch, in this original illustration. 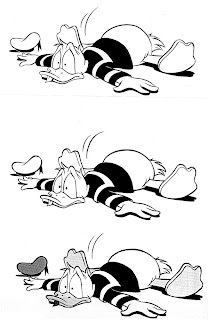 Carl Barks recreated his original image to be used as a cover for a volume of Another Rainbow's slipcased Uncle Scrooge hardcover reprint editions. The image area measures 11" x 14". Matted and framed and in Very Good condition. From the Estate of Bruce Hamilton"
Well, I couldn't recall Barks doing any recreation of this cover for the CBL sets. And the art didn't look like Barks at all to me. So I searched Inducks, the internet database that indexes all the Disney comics in the world. And, ta-da! This is what I found. What was sold at Heritage wasn't a Barks drawing, but only a redrawn version (Not by Barks!) 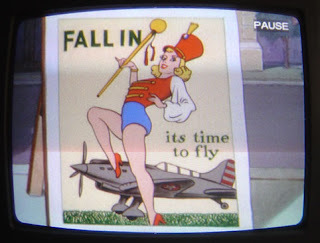 that was used as a poster in Walt Disney's Comics and stories #357. How much it went for? Some sucker paid $2629 for it!!! Well, what can we learn from this? Don't get into colleccting original Barks art unless you can tell the difference between a real Barks and some other Disney artist. 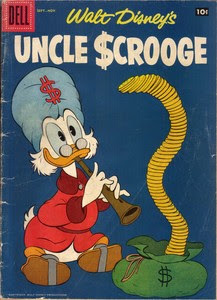 To finish this post here's Barks original cover for Uncle Scrooge #19. (Courtesy of Inducks database.) Quite a difference between the two. While my own blog is down I can always reccommend another: the Blackwing Diaries. 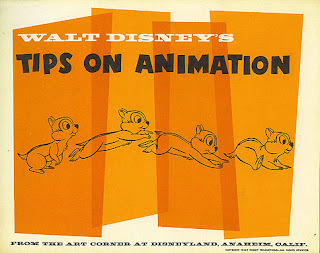 Jenny has just posted some wonderful stuff from Disneys Animation kit that was sold at Disneyland's Art Corner in the early 60's. For those of you who can't get enough of WDC&S subscription postcards, here's another one. This one's from 1948 and it seems to be traced Al Taliaferro artwork. Have been busy with other stuff and internet is down in the Studio, in case you wondered why there has been so few posts lately. 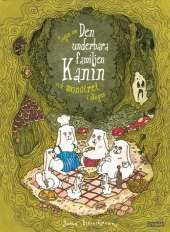 "The tale about the wonderful family Rabbit and the monster in the forest"
"Sagan om den underbara familjen Kanin och monstret i skogen". 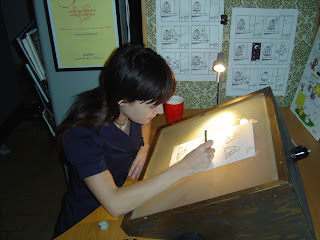 She used to be a member of the Studio where I work and I saw this book being drawn last year. It's a wonderful, and quite scary, story wich appeals to both kids and grown ups. Below is a drawing she made during a dinner in my old flat a few years ago. What it is? 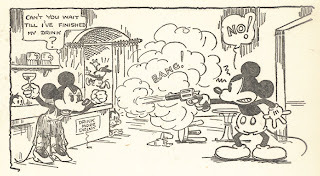 As promised here's more early 1930's Mickey from a British annual. Disney accepted much more "adult" stories back then. 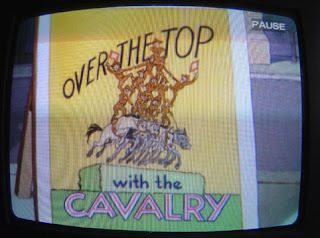 So if you dive into the big Disney pond and look at the stuff from the early days, you are bound to find odd and rare gems that might seem out of character today but that was perfectly normal in the 30's. 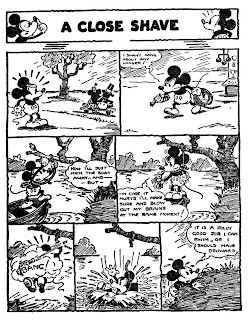 Below are two scans from one of those early Mickey stories. When we enter the story Minnie has just been crooned to by a gigolo and given a drink in the bar. 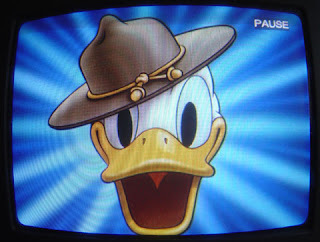 When Mickey sees them he pulls out a gun and says: "Hand over that woman, you snake!" "Stop," shouts Minnie, "wait until I've finished this cocktail, I've never had one before." "Then it will be your last," Mickey says. "I paid a shilling for you to come in here and I'm goin to have value for my money!" You would hardly see this scene in a Disney comic today. "Don't you wish your comic strip character was hot like mine?" 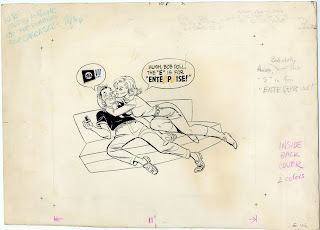 Maybe thats what Bob Lubbers thought back in the late 60's when he made this promotional drawing featuring himself with his heroine Robin Malone. This original art is currently for sale on eBay. 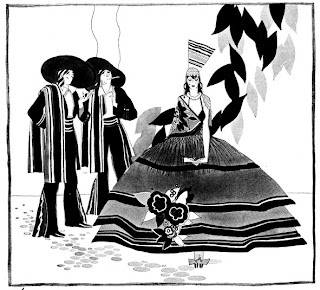 Anyone knows what publication it was created for? Well it IS (!!!) Carl Barks artwork! He probably did the pencils for these while other artists made the final colored backgrounds. 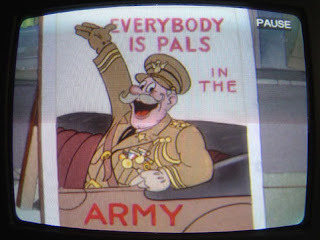 + the Donald that begins this war-time short. Not by Barks but nice. Johanna som sitter brevid mig i studion kommer från en håla kallad Vänersborg. 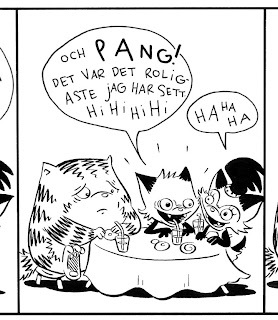 Hon är ganska lat, gillar att teckna lustiga djur och har ett par Totoro-tofflor som hon lufsar omkring med i studion. Vill man se mer av den här katten går det snart. I en tidning som heter Kamratposten!!! nummer 5 i år. I strålande fyrfärg. Det ni! 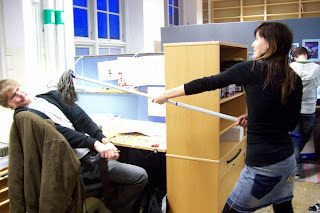 Vill man veta mer om Johanna och se mer av hennes teckningar går man bara in på hennes hemsida. Och det vill man ju. This is Johanna who sits next to me in the studio. 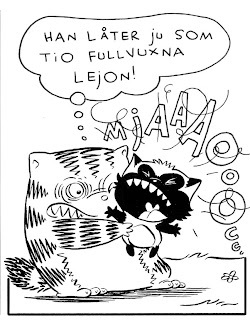 Besides the two pics of her you also see samples from her strip "Katten Nils" (Nils the Cat) wich is scheduled to begin in the next issue of a childrens magazine called Kamratposten. You can see more of her artwork if you click on the Johanna K. link to the right. Besides having a terrible headache today (Nope, those cute painkiller bunnies doesn't work...) I've scanned a set (20) of Russell Pattersons huge 1920's art instruction sheets. They are just gorgeous. Been thinking about putting them together and print them so that more can enjoy them. (I have the only complete set that I know exist. There are probably more out there but locked up in collections.) But I need the text that went with the graphics I got. Anyone that has ever seen or heard about anyone having a set of the text? Here's a sample half page from the set I got. The rest looks just as good. And, oh, I've been watching real live bunnies in the park today. I reccommend everyone to get a weekly bunny injection. 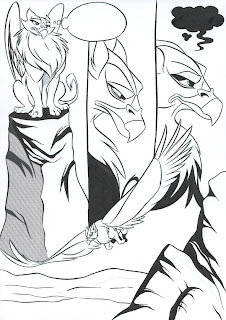 However, Hedvig challenged me to ink a panel from that story just to compare our styles and here are the results, with Rodriques original panel at the bottom, mine in the middle and Hedvigs on top. Beeing an editor at daytime for BAMSE means that I have to deal with freelancers. Having three of them in the studio (Adam, Hedvig and Simon) means that I can watch over their shoulders and bug them about composition and perspetive etc. before they turn in their work. Kim W. Andersson (See link to the right. He's also working here in the studio.) 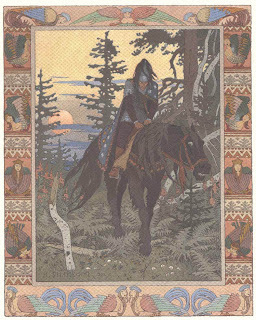 showed me a stack of illustrated russian folk tales published by Raben & Sjögren in 1978. And, wow!!! They were were just soooo beautiful. Just have to share two of the illustrations with you. Made by russian (?) 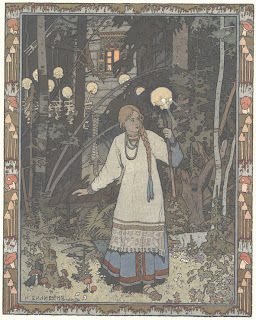 illustrator I. Bilibin around 1900. Enjoy! Let me know if you want to see more of this. I'd be happy to post some other good examples from the same books. 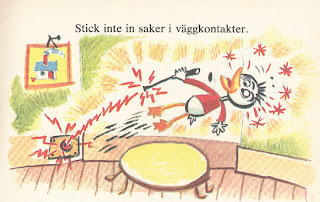 As promised yesterday, here's some wonderful art from the Swedish version of "Donald Duck's safetybook" ("Knattarna klarar allt" 1974. These drawings were not the 1971 "Knattarna lever farligt" version.) Fun to see them drawn in this really odd style. For more cool and odd stylized Disney characters take a look at the links Didier has posted on his Disney history blog. There are some wonderful commercials posted on youtube that you don't want to miss if you enjoyed this post. As some of you know Mickey Mouse tried to commit suicide in the early thirties. You've probably seen the daily strips where he tried to gas himself to death or jump from a bridge. But did you know that there was yet another suicide attempt outside the newspaper strip? 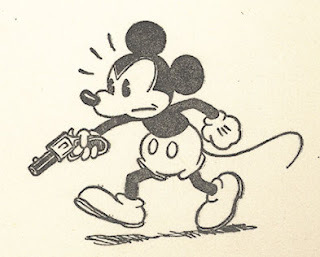 This was found in a british Mickey Mouse Annual. Enjoy! I'll probably post a few more crude, politically incorrect examples from this annual soon. 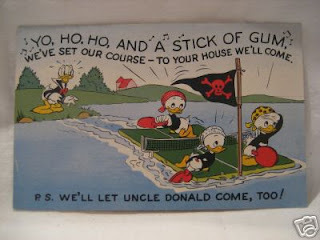 However, in tomorrows post we'll find Donald Ducks nephews playing with their life. Stay tuned! 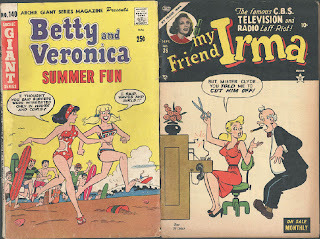 And I love them all: Irma, Betty, Starlet O'Hara, Fritzi, Veronica, Millie and even Moronica. You've guessed it, I'm a sucker for late 40's, 50's and 60's romance comics. 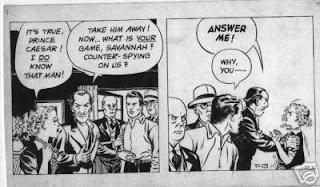 When creating the visual style for Emma & Sara I glanced more than one time at the artwork of Dan DeCarlo and Owen Fitzgerald. It just seem so easy the way they did it. Clean artwork with strong poses. No cluttering, just good artwork to tell the story. 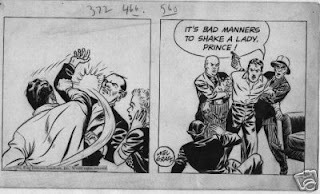 Along with Alex Toth, Bob Lubbers, Floyd Gottfredson, Carl Barks and a few others I always return to Dan and Owens artwork when I need inspiration. Here are a few covers from that stack of comics I always keep in reach when I work. As always: Click on the photos for larger images. Wouldn't it be more fun to have a hangover if painkillers came with cute bunnies on the packages? I think I've discovered a whole new market. Sell painkillers in packages one and one with a cute character, like a kinder egg. No post yesterday. Have been busy with the new Emma & Sara page and still have some inking to do before I'm finished. 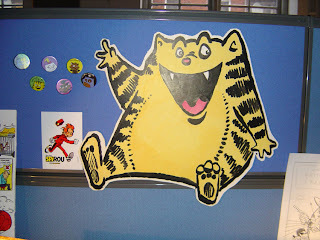 I blame it all on my assistant who has been busy herself with artwork for BAMSE. Hopefully she'll start with artwork for a new Emma & Sara page soon so I can sit back, relax and post more silly stuff om my blog. At first glance it seems like a birthday party with the Disney kids. But click on the image and look closer. To the right there is written Rest In Peace (RIP) on the glass. Then look at the table. One of Donalds nephews is scribbling a picture of a kid on the table cloth. To me this all of a sudden looks more like a funeral party for a dead kid. Bizarre, eh? (Actually it looks like something equally strange that you'd normally find on Craig Yoes "Arf Lovers Blog", which I recommend you visiting.) 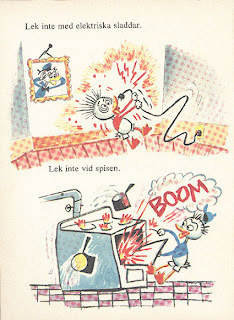 Now, while I know this was made by Swedish Disney artist Einar Lagerwall (probably in the 70's), the question is: was this ever published, where and why? Why am I posting this you might ask? Just to get them to start their own blog.